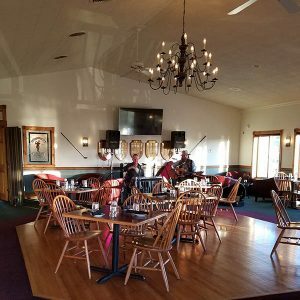 Noonan’s Supper Club has taken over the old Newport Country Club’s Grill and it is fantastic! Here in the North Country change is looked at with more than a sideways glance and a bit of grumbling. I am sure that there has been some of that, but with the dining ambiance paired with the flavorful menu that Noonan’s has brought to the Newport Restaurant Scene, there is very little to complain about. I was first shocked by how casual the space was. The large open dining room could fit a large wedding reception, yet people milled about tables chatting to each other in various states of casual to business casual dress. 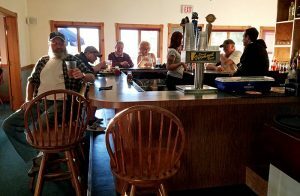 I immediately noticed that the bar was off to the side of the dining room, with a wall and open double doors that helped to separate the spaces, and the noise. The next thing to catch my attention were the doors leading out onto the deck with a beautiful view of the lake. 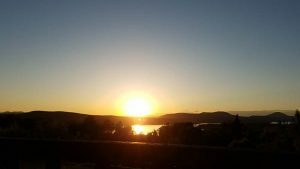 We opted to dine outside to enjoy the sunset over the lake. Our server brought menus immediately, and was soon back with our cocktail order. We took our time choosing from the menu as everything sounded wonderful and appeared to be well thought out. Having eaten at more than a few area restaurants, it was nice to see a number of options that we haven’t noticed on any other menus. We ordered entirely way to much food – but that was because I wanted to try everything! I was also very impressed with their prices. Inventive apps on the lunch and dinner menu were cheaper than apps I’ve seen at fried food joints. So starting with apps, we tried a few different offerings. I ordered the spinach salad (so I could feel better about the less healthy options I would be consuming, and because bacon and chevre are delicious). It came out warm, with the spinach lightly wilted and coated in the dressing. Chunks of bacon and mushrooms were well distributed throughout with chevre cheese crumbled all over the top. 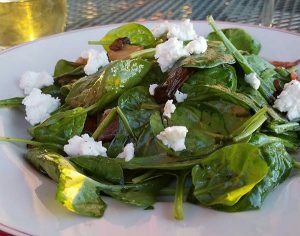 The contrast of light green with the smokiness of bacon and mushrooms was perfect – but the sweet creaminess of the chevre in place of a feta or Parmesan, brought this salad to a new level. We also ordered crab cakes with a fennel remoulade, smorrebrod, and charred octopus (a house recommendation). The crab cakes were made in house, with large chunks of crab well seasoned with only light use of a binder. If you like crab – these are up there with the best cakes in the area. The charred octopus was delicious. Now, if you don’t like the leggy pieces of calamari, don’t order this dish as that is what all the pieces are. This is also not a dish for those seeking strong, bold flavors. 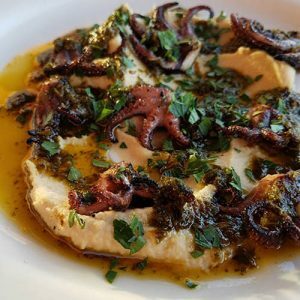 But, the grilled octopus was a nice change from the typical fried preparation in Vermont. I was also pleased with the lemon hummus served with the dish. Together, the two light flavors made a perfect appetizer. This dish on its own could easily be shared while leaving room for a heavier main course. 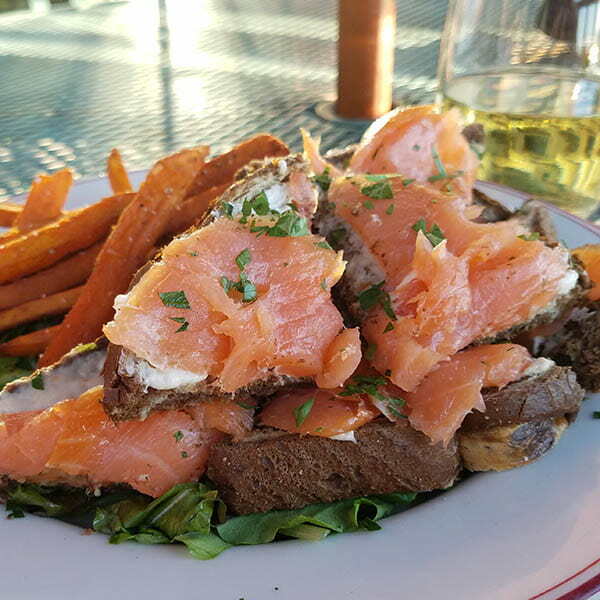 The plate was a mountain of these little sandwich points covered with this delicious house prepared smoked salmon spread with large pieces of salmon on top. 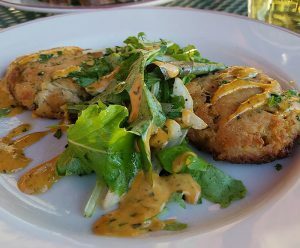 This appetizer is easily a meal and we took a portion of it home with us, but it is a must try for all seafood lovers. At lunch, it can also be ordered as a sandwich. After packing up our appetizer leftovers, the main meal came. Beyond the presentation of both plates, which were beautiful, we soon realized that the food presentation had as much to do with flavor as it did with aesthetics. I ordered stuffed chicken on recommendation from my server (I rarely order chicken when dining out). 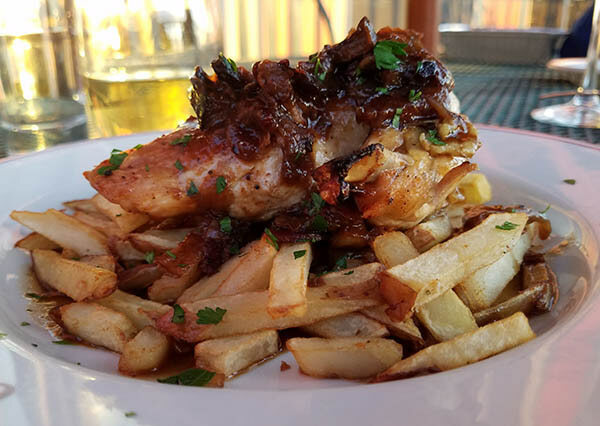 Stuffed with spinach and served Coq au Vin style, the breast was placed on a mound of French fries, and then topped with the pan sauce, mushrooms, and seasoning. The sauce was drizzled over the fries, and as I ate, all of the stuffing and juice also mixed with the fries creating a flavorful side that was akin to a gourmet poutine. 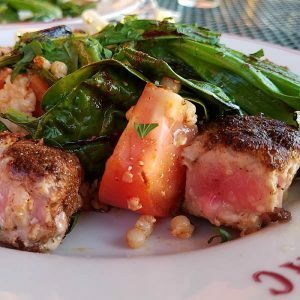 My husband ordered the Moroccan Tuna – ahi tuna cubed and seasoned, served with a couscous salad, greens, and paprika. At first he wasn’t sure about the cubed presentation of the fish – but on trying it he discovered that preparation allowed for more seasoning on each bite, and was very happy with the outcome. The fish itself was still beautifully pink. To top off this fantastic meal, we ordered a trio of Crème Brulee. This was the perfect ending to the night as the y were all mini desserts – and we were full, and because the three flavors were distinct. The trio comes with a traditional vanilla, a maple, and an allspice version. I was very impressed with the allspice and could picture it as a wonderful holiday addition. 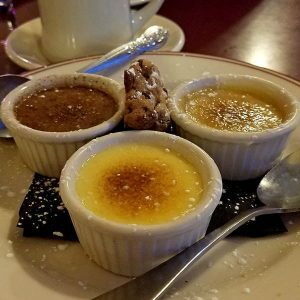 But really, what better way to end dinner than with the satisfying crunch of a Crème Brulee sugar crust. In between courses I wandered around a bit to take photos. In the bar area I noticed their pub menu. With options like fried clams and poutine, I was excited thinking about a lunch trip to the restaurant just to try the pub menu. 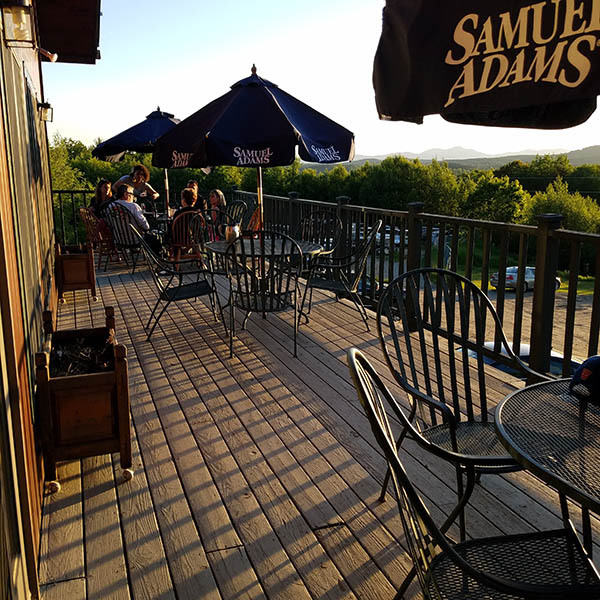 Noonan’s Supper Club at the Newport Country Club may be a new restaurant, but the service, the menu, the flavors, and the prices make me think that this restaurant will be around for years to come. 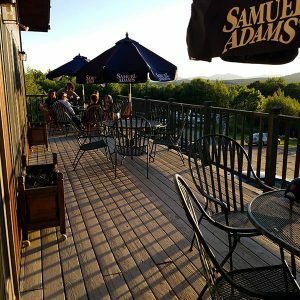 Check them out before they close for the season – they will be serving delicious food through October.